Fast fashion fatigue is the new buzzword; and so is global warming as the apparel industry has an alarmingly high carbon footprint. And that’s why, more people are getting into responsible and sustainable practices of manufacturing textiles. Today we have one such company called ‘Indigenous Industries’, co-founded by an Indo-French duo. Here is an excerpt from a brief chat with co-founder Vincent Decléty. Vincent Decléty, a French expat joined hands with Aadil Ansari from Ahmedabad to start ‘Indigenous Industries’ with the aim to promote natural dyers and textile craftsmen – and in the process make sustainable garment manufacturing a reality. Vincent, tell us what Indigenous Industries is all about? My business partner Aadil, from Ahmedabad and I (from France) have been designing textile, manufacturing it, dyeing it, and either selling the end fabrics, or manufacturing garments for other brands or our own Indigenous Industries. 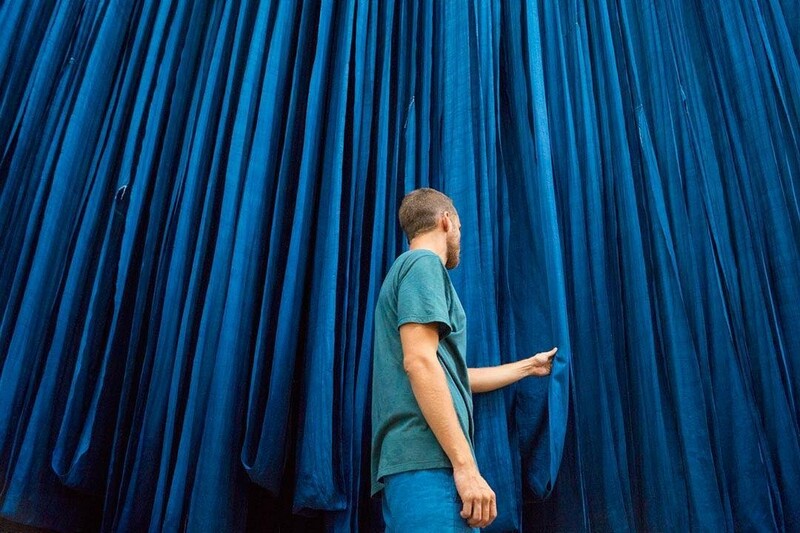 We pride ourselves on the quality of our dyes and the originality of our fabrics. Today, we manufacture for brands from India as well as from around the world, promoting only naturally dyed, sustainable textiles. We strive to promote handlooms and khadis as fabrics as one of our company’s core mission is to help and promote cottage industries. 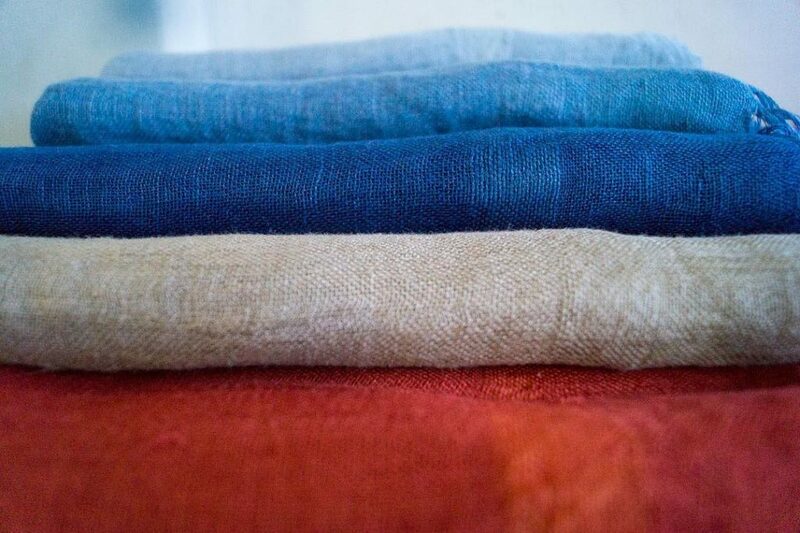 Linen Scarves handloomed in the villages of Bihar | Indigenous Industries. How did it all start? What made you set up your business in India? I met Aadil back in 2014. He was weaving some amazing magic with textiles in South India, experimenting with dyes, batiks, fabric construction, weaves and patterns. I got curious about the craftsmanship and ancient Indian techniques of making sustainable clothing and decided to bring it to a wider audience on a bigger platform. Thanks to our traveling from Tamil Nadu to Gujarat, our understanding about textiles and its business only grew. By the time we were through with Bihar and Assam, ideas fused. We ended our travel by opening up a sampling workshop in a small place on the outskirts of Ahmedabad. It was here that we started our process of dyeing, printing and drawing. We spent over a year experimenting with fabrics and all the while looking to improve our fabric quality and the fastness of the dyes. Watch Riswan Bhai, Indigenous Industries’ batik master make hand-drawn and dye batik t-shirts – each piece individually! What is your personal motivation behind promoting eco-friendly fashion? The fashion industry is the second largest polluter in the world and our sole idea behind this industry setup is to promote sustainability and low waste production among the masses. We want the world to become greener, and our societies to further respect the planet.Sustainability is a core component of what we both personally believe in. We believe India to be the place where sustainability will become intertwined with day to day modern society, and we’re glad to be here to witness it. We also want the human capital and creativity behind garment manufacturing to be brought forth in the eyes of our customers. And most importantly we want to provide our artisans with a safe space to express and perfect their art. Breathable, chemical free staples from Indigenous Industries. 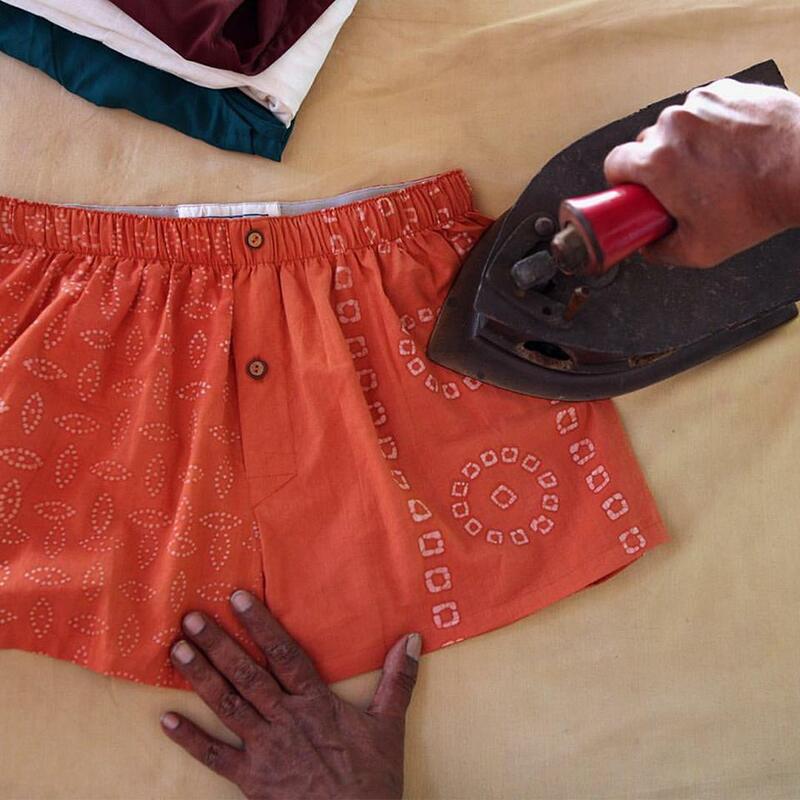 Batik boxer shorts, made out of organic cotton and dyed with yellow myrobalan (terminalia chebula). Where do you retail your merchandise? We sell our products under own brand ‘Indigenous Industries’ on our website. We also have our products on display on Jaypore, Bunosilo and ‘A Little Market’ and various shop outlets in Pondicherry, Paris, Singapore and London. 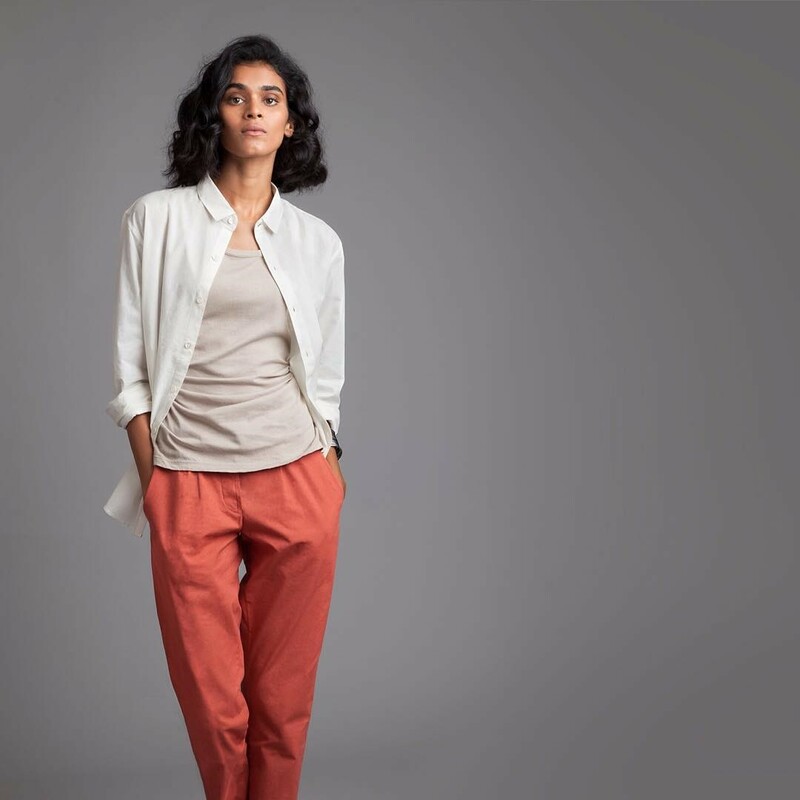 “We’re always on the lookout for talented fashion designers who would want to work with natural dyes and sustainable textiles.” So interested designers may reach out to them. Follow Indigenous Industries on Facebook and Instagram. 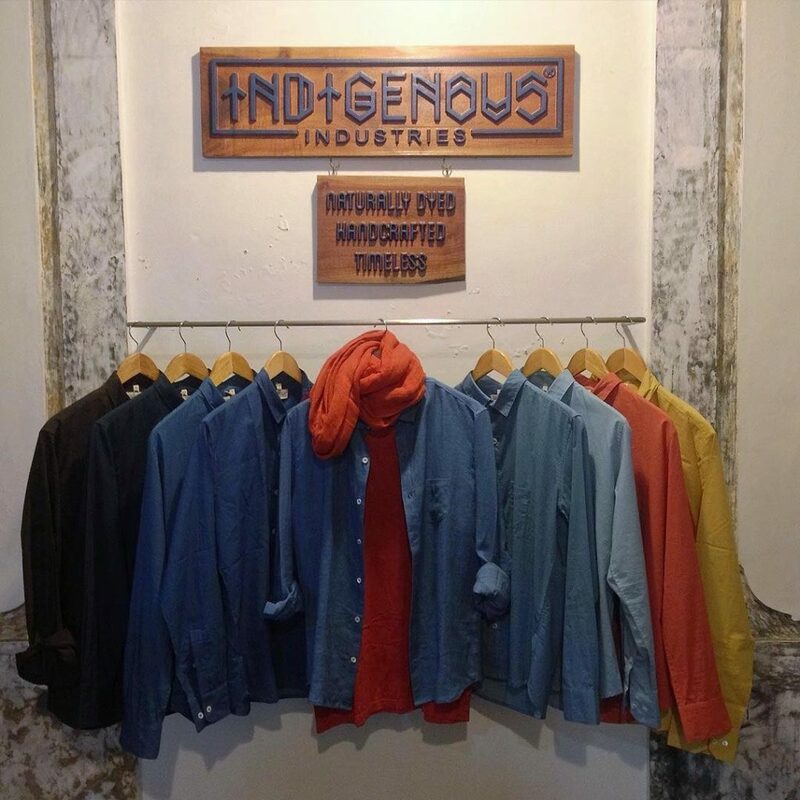 Indigenous Industries Apparel on display at Artika Cafe in Pondicherry.